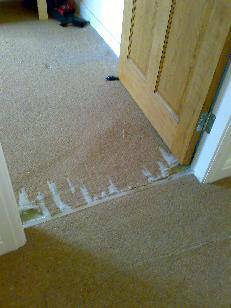 Carpet repairs in Cannock, Staffordshire. "After an evening with friends, we returned home to find our dog had managed to lock himself in the Nursery! In an attempt to get out, he proceeded to try and dig through the corner of the room, and literally savaged the carpet into pieces... With the room being based on the main floor, with the same carpet running throughout we thought it was going to cost us in the thousands to repair and replace. A quick search on Google put us in touch with Roy the Carpet Doctor. From the outset his carpet repair service was second to none. In this day in age it is rare to find good, honest and reliable service, with a fantastic standard of workmanship to boot! The carpet repair is literally seemless, and an invisible.We are now back to normal without having had to re-carpet the house! 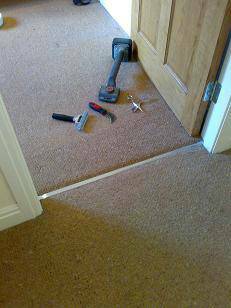 We will be using Carpet Doctor for any future carpet repairs or carpet fittings without doubt!" We look forward to seeing you again in the future- Thank you again for your work and effort. David and Jen, Cannock Staffordshire.